As expected, the biggest highlight in the specs of the new Samsung Galaxy Tab S family is the display. It is an AMOLED unit with the generous resolution of 2560 x 1600 pixels. It is bound to be the first AMOLED display on a Samsung slate since the Samsung Galaxy Tab 7.7 from 2011. The Samsung Galaxy Tab S slates will be powered by an Exynos 5 SoC with big.LITTLE octa-core CPU (four 1.9GHz Cortex-A15 cores and four 1.3GHz Cortex-A7 cores). Video processing duties will be handled by a hexa-core Mali-T628 GPU. There will be 3GB of 32-bit dual-channel 933 MHz LPDDR3e RAM on board. Leaked screenshots reveal that the upcoming tablet family will be no slouch when official. See them below. The imaging department of the Samsung Galaxy S Tab lineup will consist of an 8MP main shooter capable of recording 1080p video, and 2.1MP front-facing unit. Unsurprisingly, there will be a full connectivity suite including IR blaster and optional LTE on board. The OS on board of the slate as seen in the screenshots above is Android 4.4.2 KitKat. There is no word on the UX of the slate just yet. The Samsung Galaxy Tab S tablets will be the company’s first to feature a fingerprint sensor. It will be utilized for unlocking the device and private folders within it, as well as for making PayPal transactions like in the Samsung Galaxy S5. Visually, the Samsung Galaxy Tab S family is said to sport the same perforated look as the Samsung Galaxy S5. It will be available in two color schemes – Shimmer White and Titanium Grey. 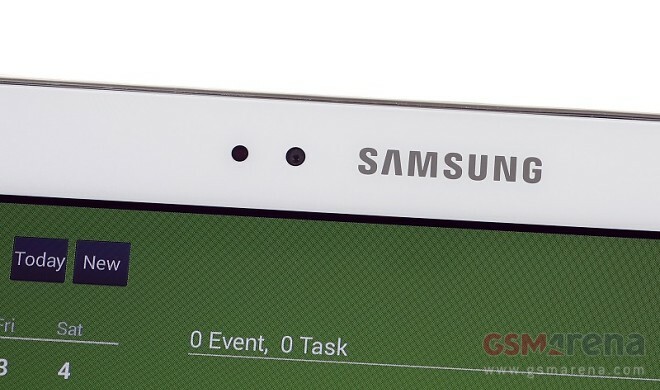 The 8.4” Samsung Galaxy Tab S will sport and model numbers SM-T700 (Wi-Fi-only) and SM-T705 (LTE). The 10.5” version will be SM-T800 (Wi-Fi-only) and SM-T805 (LTE). The Samsung Galaxy Tab S family is yet to go official. When out, the lineup is almost certain to sit above the Samsung Galaxy Tab Pro family.